The Super bowl count down is on once again and you’re probably wondering where to go and what to do for the game, if so, we have good news for you – The Sporting Globe have you covered! 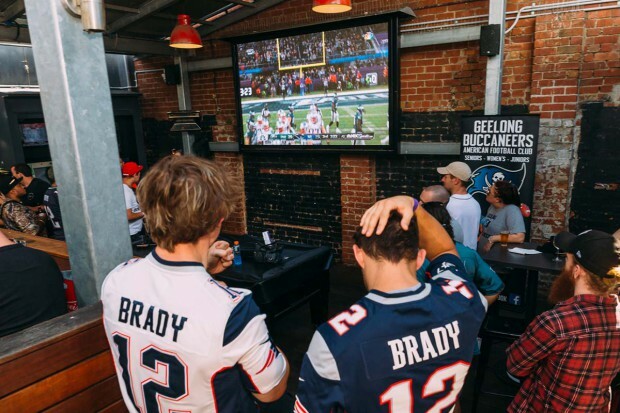 Whether you’re a Rams fan or Patriots through and through, you’re surely to be in Super bowl heaven with Bacon Brekky burgers on the grill, Bud on taps, VIP booths and the pre-show and game up on all the big screens. The Sporting Globe are well equipped to satisfy all of your Super bowl needs and as if it couldn’t get better they are offering a chance to win an NFL experience unlike any other and all you have to do is join them on the day to go into the draw. The prize contains two tickets to the first round of next season, flights and accommodation thrown in and a massive NFL fan apparel pack – this is the ultimate NFL fan’s prize. Booking packages for the day are available and include a lot of the big day essentials – brekky burgers, Buds and even some shared wing plates. You can organise these via the website or on location but beware these spaces will fill quickly given everything that is on offer for the day including the entry into the epic NFL prize draw! Book VIA sportingglobe.com.au/superbowl/geelong or call (03) 7002 2910. The Sporting Globe is located at 175-177 Ryrie St, Geelong.